Mile #364.1 - Craggy Pinnacle Trail. A short hike from the Craggy Dome Parking Area leads to a rocky terrace offering 360 degree views of beautiful mountain vistas. The 0.7 mile trail itself which leads to the overlook is impressive as well -- the trail winds its way through tunnels of rhododendron (right) and is lined with various wildflowers, interesting lichens, mosses, ferns and other vegetation. This is a must-see destination! Mile #364.6 - Craggy Garden Visitor Center. 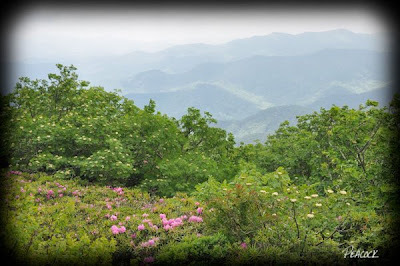 Here you can take in the views, buy a gift for your favorite blogger or take the Craggy Garden's Trail to the Craggy Gardens to see the rhododendron and other wildflowers. There is a trail loop here, or you can continue on the trail to the picnic area. Mile #367.5 - the entrance to the Craggy Garden's Picnic Area. Drive this short, winding spur for a short distance and you'll arrive at a popular picnic area -- Here you can take the Craggy Gardens Trail (which is actually a section of the Mountains to Sea Trail) through the woods to a heath bald and then on to the Visitor Center. Click here for an excellent interactive map and for more information. Note 1: When we arrived on Saturday (June 20th), the rhododendrons were just past their peak, although a few remained. For next year, I'm thinking a little earlier would be a good time to visit. But whatever the season, the Craggy Garden Pinnacle trail is definitely worthwhile. 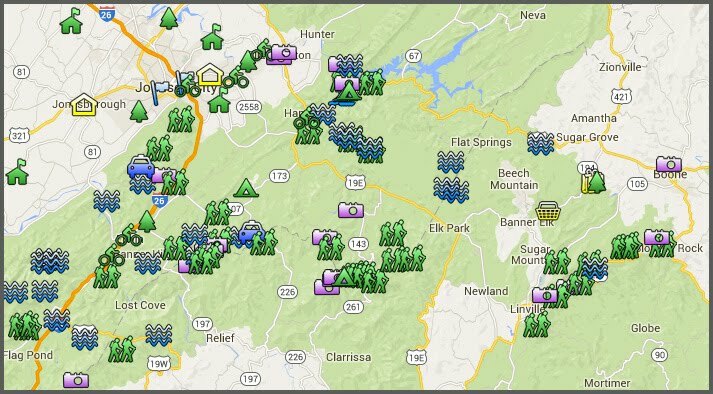 Note 2: Because of repairs being made to the parkway, there is limited parking at both the Visitor's Center and the Craggy Pinnacle Parking Area.